A gorgeous pink bear ready to bring peace and love to the world. 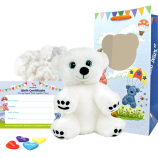 This kit contains Peace and Love Bear 8" bear skin, super-soft stuffing, heart charm, birth certificate, party invitation and deluxe carry bag. 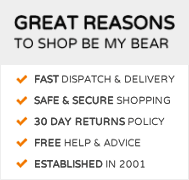 Our Peace and Love Bear has gorgeous pink fur with white paws, one of which has a pink embroidered peace symbol on it. Her fur is also covered in darker pink spots and peace symbols because all Peace and Love bear wants is peace and love in the world! 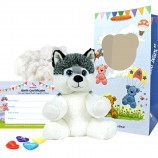 Peace and Love Bear is a member of the eight inch range of build anywhere bears from Be My Bear. 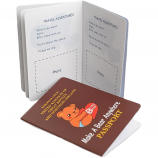 Peace and Love Bear was inspired by people including Nelson Mandela, Martin Luther King and more recently Malala Yousafzai for their part in promoting world peace and tolerance in the world. Peace and Love Bear likes happy people and loves to eat with others rather than alone... When eating she loves nothing more than Peace-za (pizza to you and I)! 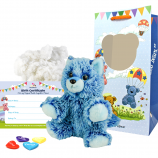 Peace and Love Bear is suitable for children aged three and over and is the ideal gift for special occasions and teddy bear making birthday parties. 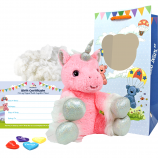 As with all of Be My Bear's teddy bear and stuffed animal making kits you will receive your Peace and Love Bear skin with one-way zip closure, a bag of soft and fluffy stuffing, our satin make-a-wish heart charm to bring Peace and Love Bear to life, a birth certificate, party invitations and instructions. To complete the package we also include a luxury gift bag so Peace and Love Bear can be carried around in style.